Could the "social impact bond" help to improve services in dementia care? It’s impossible to ignore the occasional spate of reports of ‘care home scandals’, including Winterbourne View and Orchid View. Whilst a direction of travel might be to advance people living ‘successfully’ as long as possible independently, there’ll be some people for whom a care home might be appropriate. There are particular aims of policy designed to support living well with dementia, such as combating loneliness and providing meaningful leisure activities, which can possibly be achieved through high quality care homes. It’s pretty often that you hear of social care being “on its knees”, due to drastic chronic underfunding. A concern about attracting investment from the private sector is that this will help to accelerate the lack of financial resource allocation from the State. And yet this is the opposite to the argument of resources ‘leeching’ out of the public sector into the private sector. In terms of the ‘business model’, there are concerns that, to maximise shareholder dividend, staff will not be incentivised to ‘care well’, if they are barely meeting the requirements of the national minimum wage. Whilst the employer emphasises ‘flexibility’ of zero hours contracts, for many such contracts are symbolic of a lack of commitment for sustained employment by the employer. So the idea of bonds being used to prop up dementia care, currently one of the three big arms of the Prime Minister’s Dementia Challenge, has gained some momentum, for example here. Bonds are effectively “IOUs“, and concerns remain for them as in the private finance initiative – such as who actually benefits, the prolonged threat of penalty for not being able to meet your loan repayments, the issue of who decides the outcomes by which performance will be assessed, and who actually manages or controls the enterprise. Social Impact Bonds (SIBs) are depicted as “a way of enabling innovation, creating flexible contracts around social outcomes and providing linked investment“. But for some, they are a vehicle for enabling ‘privatisation by stealth’. The current Labour opposition officially is trying to distance itself from any mechanisms promoting the privatisation of the NHS, and yet it is known Chris Ham and Norman Lamb wish to publish a report imminently on the possible use of SIBs in policy under the auspices of the King’s Fund. 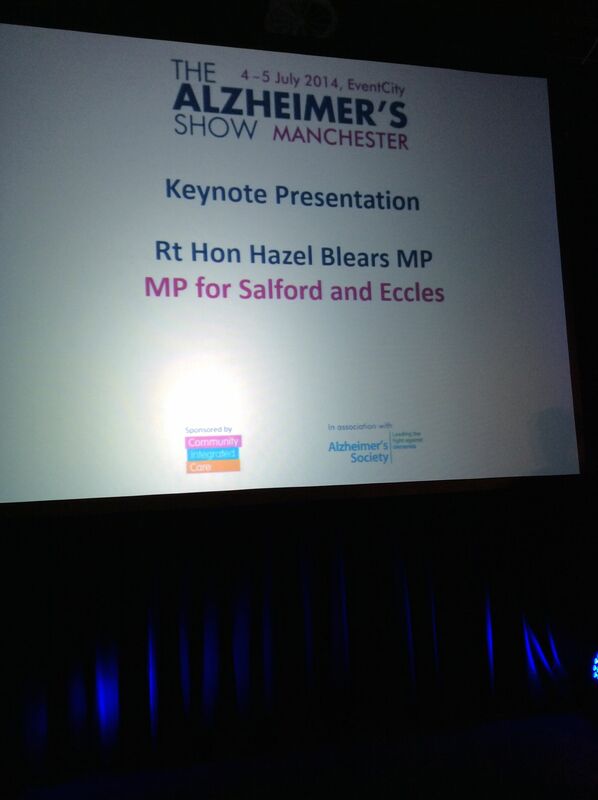 This is the title slide of Hazel Blears’ presentation for the Alzheimer’s Show on Friday. And here is a section of her talk. Hazel has a strong personal attachment to campaigning on dementia, and is particularly interested and influential in the direction of travel, not least in her rôle as Vice Chair of the All Party Parliamentary Group on dementia, a cross party group made up of MPs and Peers with an interest in dementia. Andy Burnham MP, Shadow Secretary of State for Health, has made it clear that it is his firm and settled intention to repeal the Health and Social Care Act (2012). The current Prime Minister’s Dementia Challenge is to come to an end officially in March 2015. Dementia UK set up some time ago its innovative ‘Admiral Nurses’ scheme, to provide specialist nurses who could help people with dementia and family carers to improve the quality of life of people with dementia and family carers. Burnham has also let it be known that he intends to subsume social care within the NHS under the construct of ‘whole person care’. Whichever various formulations of ‘whole person care’ you look at, you tend to find a ‘care coordinator’ somewhere. The exact job description of the care coordinator, nor indeed which specialisms might be best suited to accomplish this rôle, is somewhat unclear presently. But it is all too common to hear of people being diagnosed with dementia being ‘lost in the system’, sometimes for years without follow up. A “care coordinator” might help to boost access to the following services: emotional support, enable short breaks for people with dementia and anyone in a caring role, promote nutritious meals, ensure medications are given on time, ensure the correct medications have been subscribed (for example avoiding antipsychotic medications in individuals who might be unsuited to these), advice about suitable housing (including downsizing), ensure all physical commodities are properly medically managed; and so the list goes on. I feel it’s pretty likely there’ll be a ‘first mover advantage‘ effect for any entity which takes up this coordination rôle in dementia care. But the tension between this and the Opposition’s policy is palpable: one cannot talk of this entity being ‘the first to enter the market’, as many wish (and expect) Labour to abolish the internal market in health care. Such a coordinating entity could well be a recipient of a SIB – but is this like the PFI of social care? PFI by and large has an incredibly negative press amongst members of the general public. But on the other hand, is it vindictive to prevent a social enterprise from pitching from such a service? If that entity has the technical ‘know how’ to run operations nationally competently and at a reasonable price, would that be preferable to the State running such services when projects such as NHS IT and universal credit have not gone terribly well? In our jurisdiction, private companies can hide easily being a corporate veil, and are for example currently not readily accountable through freedom of information legislation. This is despite numerous requests to Jeremy Hunt in parliament about parity in disclosure requirements from both private and public providers. And the track record of some outsourcing companies in the private sector, it is said, has been terrible. Jeremy Hunt and Norman Lamb are currently in control of NHS and care policy, but there might be a fundamental change in direction from the next Government. Or there might not be.